About four years ago, a spate of reviews and articles began to come out focused on the work of one Sigizmund Krzhizhanovsky. Since then, at odd and sometimes aha! moments, someone has sidled up to me and asked in hushed mispronounced tones, almost whispering, Have you read Krzhizhanovsky? Several years ago, the Paris Review backgrounded Krzhizhanovsky’s work by noting that in 1939, Krzhizhanovsky, despite his restricted publication history, was nevertheless elected to the Writers’ Union—which meant that posthumously he was eligible for the process of “immortalization.” In 1953, Stalin died.... In 1957—the same year as Pasternak’s Doctor Zhivago—a commission was set up to examine Krzhizhanovsky’s literary legacy. It lasted two years and was then disbanded, having drafted a publishing plan that was never implemented. Then, in 1976, Vadim Perelmuter, a poet, literary historian, and essayist, discovered Krzhizhanovsky’s archive. He had to wait until 1989 and the full thaw of perestroika before he could publish one of Krzhizhanovsky’s stories. Between 2001 and 2008, Perelmuter finally edited a handsome five-volume edition of Krzhizhanovsky’s works. One first assumes that Krzhizhanovsky wrote in an era of self-censorship. The writer/ artist self-censors thinking to save him- or herself; but, make no mistake, it is only a stingy tactic on the part of the powerful to employ the powerless in their own suppression. Still, it is no secret that Russia has had a long history of persecuting its most outstanding writers and intellectuals to the point where silence is certainly understood if not seeming, to our naïve eyes, a solution. Like the situation in this collection’s first, “Quadraturin,” where the narrator occupies an apartment that he can barely turn around in, at the time Krzhizhanovsky was writing, the published literary scene did not allow writers much wiggle room. Though Soviet standards of acceptable and unacceptable artistic creation were not yet set and in full swing, there was little standing room. Indeed, though expanding laterally under the magical spill of the space-enlarging solution, Quadraturin, the narrator’s rooms never expanded up. Krzhizhanovsky’s tales are peopled with “former persons,” a term the Bolsheviks applied to persons they deemed useless. Those who have thus fallen in station inhabit a hungry periphery where the absurdly fantastic is no stranger and where key protagonists come in strange packages. Take the two pieces, “The Bookmark” and “Someone Else’s Theme.” Both plumb the devices of fiction and the writer’s imagination, while alluding to the challenges of Soviet officialdom as it continued to infect Russian consciousness. In both, is an off-kilter narrator— confined to his quarters, inhabiting a marginal world of disenfranchised artists, out of work or underemployed literary critics, soup kitchen habitués whose world consists of intellectual and philosophical discussions that are, to say the least, not part of the Soviet mainstream. In “Bookmark,” the narrator retires his bookmark for lack of any reading worth returning to. The narrator is a creature of habit, though. He leaves his rooms for his usual afternoon walk, and hears a man on a park bench declaiming the story of the Tour d’Eiffel, which has abandoned its moorings and gone on walkabout. Enter the “theme catcher,” a type common to both pieces, in that he is an unruly character ambiguously drawn as real within the story, but possibly a fiction within a fiction who engages the narrator in even more fantastic analyses of the function of character in fiction. [in speaking of a character who has escaped his author’s leash] Work comes to a halt. One day, the writer happens to look in on a literary reading and is stunned to find himself face-to-face with his character. The character tries to run out the door. But the writer...grabs him by the shoulder and elbow, like this, and says: “Listen, just between us, you’re not a person, you’re a…” They end by agreeing not to spoil things for each other anymore and to devote themselves wholeheartedly the their common cause: the novel. Krzhizhanovsky’s theme catcher ranges far and wide—this theme, that—all for naught; and ultimately, it is the narrator who, returning to his rooms and his own work, reaches an appropriate pause, not an end, and inserts his neglected bookmark between those pages. We know he will return to write some more; and, in the meantime, we are left to ponder the Chinese box that is the human imagination meeting the real, the imagined, and the imaginary. [T]he critic, as a professional reader, reads and reads until he encounters himself.... The point is that characters do not, of course, turn into people, but people turn into characters, that is they serve as material for people who invent people. Turgenev’s Rudin, Lexhnev, Bazarov, and Piasov impress us precisely because life bears them out with its own approximations, if not doubles. As in “Bookmark,” Straight then addresses the subject of the not-invented and the invented; however, he poses these differences in terms of a rivalry between the two. The invented person persists past the lifetime of the not-invented. To add insult to injury, in terms of the invented, “the author made you up like an arithmetic problem...figured you out…[and] divined your existence without ever having met you.” I am resisting the image of the Russian doll within a doll in favor of a Chinese box, an aberrant onion, or dammit, a Rubric’s cube gone coo-coo; for Krzhizhanovsky paints the interpenetration of the imagined and the “real” not as a simple layered process, but a far more chaotic one. Saul Straight himself? He is a character within a story about a character who, elusive and often invisible, maybe a purely fictional, fictional character or may be a fictional real character whose concerns are imaginarily portrayed. Straight, too, makes the rounds in the discouraging world of publishing; and not able to gain admittance into the world of legitimized writers, he tacks back and forth like a sailboat on a rugged sea. Reading the newspaper back to front for the poignancy of the classifieds, he makes financial hay as a dognapper—though struck by the authenticity of emotion he finds in those ads for lost pets, yes, it is for the reward. He then falls on hard times; and the next time the narrator encounters him, he is in rags and tatters, his swank shoes begrimed, he, a disheveled mess. When the narrator takes him back to his own rooms to warm up, Straight, reacting with hostility to the narrator’s sympathy, launches a campaign against the evils of sympathy. This lasts until the narrator points out that Straight of all people is most sympathetic. That revelation nearly destroys Straight; and he disappears. I will spare the reader the precise ending, suffice it to say that the narrator thinks he sees Straight out of the corner of his eye on a street corner, this place or that, just as one who has been traumatized by sudden loss thinks they see their dear one once more. Or, to be more accurate, the thought of Straight, his afterglow, hovers at the edge of the narrator’s thoughts, never articulated but stalking him; and hence my suggestion that perhaps Straight, himself, is another unruly fictional character, on the run, a fiction within a fiction, threatening to go amok. Shterer is man who, since childhood, has walked to the beat of a different drummer, a fantastic Einstein-esque who expands upon the topic of time and space (he even uses the Einstein-coined term, “space time,” at one point) as background to creating a time traveling machine, a “time cutter.” He expounds his theoretical base in a way that the reader is not sure if his theories are robust, and the author a closet quantum physicist, or if they are totally absurd. Parallel universes come to mind. Carroll wrote his fiction for children—or one little girl at least—though I wonder if we only declaw and relegate certain work to “children’s books,” because we deeply distrust the fantastic and on a certain level do not know what to do with it. All the while using the fantastic, Krzhizhanovsky is squarely in the adult camp. Certainly, a time machine does seem fantasmagoric. However, I do not deny the notion that, caught in a sequential mode of perception, we might perceive time inaccurately, that the past and the present can not only coexist but can rearrange themselves to coincide. I leave the reader to the entire tale. The publisher moved closer to Shterer. One can almost hear the ka-ching of the cash register in the mind of that editor, as he mentally distorts Shterer’s work to suit the demands of the Soviet literary world. Such repeated encounters lead me to believe that Krzhizhanovsky was not so much self-censoring but acknowledging the literary bankruptcy of the times; for he often then segues into a conversation where his characters discuss the key challenges of writing fiction. In fact, I wonder if, as in a funhouse mirror, too much our own contemporary work lurches towards the bland, smoothed surfaced sameness as the published Soviet writers of Krzhizhanovsky’s time. This is not to say that there are no interesting writers in our own writing world; however, what are the others after? What is the realism sought? too often the author never separates him- or herself from the narrator; and that focus upstages any exciting characterization. Then what we have is craft not content, a literary selfie as opposed to the Soviet-style cardboard crowd-self, neither of which are that compelling. To be brutally honest, I am not interested in the writer’s personality. I am interested in a multilayered fiction of ideas, of thought, of interesting characters who invite me to come out and play, even if, occasionally they have a hidden agenda. For those of us who yearn for such, I heartily encourage reading this quirky, brain teaser of an author’s work. A Note on the Translation: When I was rather young, the great teachers of pantomime and physical theatre still lived and worked in Paris. Some had already passed; but we—for I was one of them—we mime students constituted a precious, incestuous lot, staying up long hours over coffee and cheap French wine to argue about the virtues and methods of Marcel Marceau, Jacques Le Coq, Etienne Decroux. Repeatedly we watched some very old films: Jean Louis Barrault’s famous performance in Les Enfants du Paradis, Buster Keaton, Chaplin, the Marx brothers, Laurel and Hardy—this was physical theatre and comedy par excellence; and what we concluded was that the best were those who, though falling all over themselves in seemingly terminal klutziness, did not reveal what a cleverly orchestrated dance it was. With musical accompaniments sounding for all the world like a band in a tin can, even with the advent of sound, their art was nonetheless conceived in silence. It had to be broad, but, underneath and invisibly, it depended on precise, cleverly controlled technique. What does pantomime have to do with Krzhizhanovsky? Reading and mime are silent activities, but that’s not it. It’s the translation. 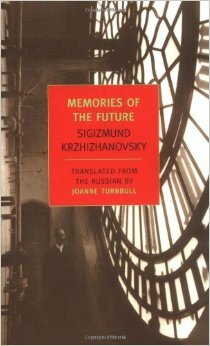 I found myself reading Krzhizhanovsky’s Memories of the Future and saying to myself, “stairs steep as life, “this language is fab! but then realizing that I was not reading Russian—not one of my languages—but translator, Joanne Turnbull’s English. I had been seduced by her skillful and quite invisible techniques. All along, the original had been well-served. Bronwyn Mills holds an MFA from UMass, Amherst, and a Ph.D. from NYU where she was an Anais Nin Fellow. Later, a Fulbright Fellow (La République du Bénin, West Africa) she travels widely, and has lived in New York City, Istanbul, Turkey; and Paris, France. For many years a dance and theatre writer for two regional arts publications in New England, she is also one of three founding editors for the new international online journal, The Wall. Books include Night of the Luna Moths (poetry,) a fabulist novel, Beastly’s Tale; and she is currently working on Canary Club, a novel set in medieval Spain. Her work has appeared in IKON, Frigate, Talisman: a Journal of Contemporary Poetry and Poetics and, forthcoming, Agni. She guest-edited the Turkish issue of Absinthe: New European Writing (#19.) Bronwyn has taught at Stevens Institute of Technology; Kadir Has University in Istanbul; and Abomey- Calavi in Bénin. From time to time she publishes work on African vodou. Bronwyn lives and writes in a tiny mountain village far, far away.